Adds parts for M551A1 series vehicle and configuration for "Desert Storm"
I have to feel a bit disappointed in Academy. They have shown themselves to have some of the best ideas and molding going in today's market and yet their research tends to not be applied to their kits, which is a shame. Three kit lines which could have been big winners were their M3 light tanks, their M3 medium series, and their M551 Sheridans. When the M551 Sheridan Vietnam kit (No. 13011) was released two years ago, it was a initially a very welcome model as it replaces the awful Tamiya kit and Academy's even worse clone of that kit. But once it got into the hands of the modelers, it showed a number of problems with shapes and details which was unfortunate. Its more annoying flaws were some shape problems with the turret, a length and angle problem at the rear of the hull, and errors in the location of the suspension arms. While I personally can find the first two errors (the engine deck is too long, resulting in too steep an angle of the rear upper hull plate) the only error I can find with the basic suspension geometry are some hollow areas behind the road wheels I don't seem to find on any of the production vehicles. This kit does correct some of the detail errors of the Vietnam kit and provides some new bits of use. Some items like the AN/VVS-3 searchlight lens are still missing, which is another annoyance that could have been fixed, however. As I noted when I reviewed the original kit, some items were skimped over in order to make a reasonably produceable kit. One point concerns the road wheels, which have a very annoying lip around the rims (a sure dust and mud magnet) whereas the kit's wheels are simple dished affairs. There is a large hole in the belly but it is NOT a motorization hole; this is the vehicle's belly escape hatch (there is a shape like this which the belly armor leaves a cutout for, figuring that the center of the hull is not as likely as the bow or sides to suffer mine effects; however, it is much farther forward so this should just be cemented in place, filled and forgotten.) One nice touch is the provision of buckles and strap tiedowns on the C (suspension) sprues, which will be very handy items for modelers to use. As for the kit, it provides the main sprues from the 1-11th ACR Vietnam model with a large new sprue of parts for the A1 and upgrades of earlier bits and two from the very nice US Machine Gun Set by Academy; this vehicle actually comes with three .50 caliber M2HB guns and two .30 caliber Brownings, so it provides four of them for the spares box up front. It also comes with the OVM sprue from the M4 series kits and more extra bits. Some new basic parts are included, such as new idler mounts and idler arms as well as shackles and hull details. 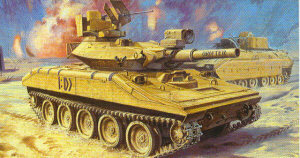 The kit does provide most of the detail changes between the M551 and the M551A1. The massive smoke grenade launchers are replaced by standardized modular units as used by all other US vehicles today, but the brackets for the older ones are now also provided. Also included are the laser rangefinder and detail changes to the entire "crow's nest" commander's station and a new bustle rack which appears to be a close copy of the one used by the 82nd Airborne Division vehicles. Maddeningly the Academy folks have provided a number of spare bits to dress up the model, such as a spare wheel, fuel and water cans, ammo cans (including the popular 20mm boxes used for stowage) but then they provide ten links of track. Other than some ejection pin marks on the inner face of the links, they are more accurate than the two vinyl runs which come with the kit. Somewhere along the line Academy either took their dimensions from a Sheridan with worn-out tracks or missing its rubber pads, for their tracks come without them. This is more than a minor annoyance, as correcting it will call for either getting the Legend Sheridan track and suspension kit or a set of Fruil tracks. Decals are provided for three different Sheridans from 3-73 Armor, 82nd Airborne Division, during Desert Shield. (My readings were that the Sheridans were used for security and did not directly participate in combat operations once the "heavy" divisions arrived in Saudi Arabia, but the 82nd's Sheridans were the first "boots on the ground" armor for US forces.) However, the two named vehicles are "Die Hard" (listed as C-11) and "Drifter" (B-34) which should have been part of D Company, and photos of "Deathstalker" (D-34) seem to bear this out. I could be wrong (as most of the photos of 3-73 Armor with the flashier markings were taken much later in the campaign; upon arrival they were just quickly repainted in FS30277 Sand and not the later shade) but few units rarely stray from American Army traditions (company letter is the first letter of the vehicle's name.) The geometric shape markings likewise indicate different subunits and platoons. Overall, except for the ultra-purist the only really problematic area of this kit are the skinny and incorrect tracks, and most modelers will probably be happy to build this kit to complete their collection. I have seen one individual, dim of reasoning perhaps, state the Tamiya kit is actually better but that is pure fantasy. I suggest he seek out the corrected version I built of that model that was presented in Fine Scale Modeler with one photo showing the Tamiya kit's hull enclosing the ENTIRE hull of a correct size 1/35 scale Sheridan before making such boorish comments.